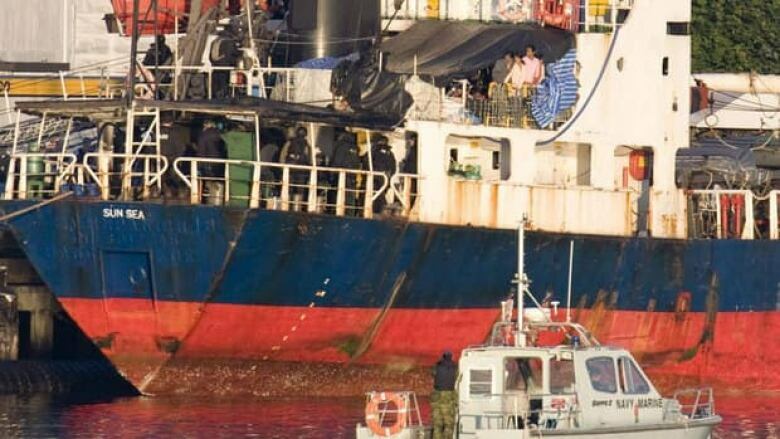 The MV Sun Sea carried nearly 500 Tamil migrants to Canada eight years ago, but now the rusting cargo ship sits forlornly on the B.C. coast — an unwanted vessel of toxins including asbestos, PCBs and mould, documents reveal. Government looking for environmentally safe way to dispose of MV Sun Sea off of B.C. The federal government, which has been stuck with the rickety ship for years, is looking for an "environmentally sound" and cost-effective way of getting rid of it. Organizers of the MV Sun Sea's 2010 voyage from strife-torn Sri Lanka promised passage in return for $20,000 to $30,000 per person. The border agency and other federal partners "are working diligently" to figure out how to dispose of the ship, says a March 2018 briefing note obtained through the Access to Information Act. "The government of Canada has made the determination that the MV Sun Sea must be disposed of in an environmentally sound manner, in a Canadian facility, in accordance with Canadian law," says an initial outline of the work prepared by the border agency. Federal officials had no immediate comment on the status of the plans. A January 2016 examination revealed several hazardous materials on board the MV Sun Sea, including mold throughout the vessel, asbestos, lead-laden paint, PCBs in paint and cabling coating, mercury in gauges and fluorescent lamps, and radioactive substances in smoke detectors and navigation equipment. Due to the ship's condition, the government will not allow a contractor to tow it to a work site beyond the waters of southern British Columbia. In addition, any company hired to do the dismantling will not be permitted to sell it to a broker. Ensuring the MV Sun Sea is disposed of in Canada under rigorous controls is "much better than this vessel ending up in Bangladesh or India or somewhere," he said. "It's the only way that it can be done."